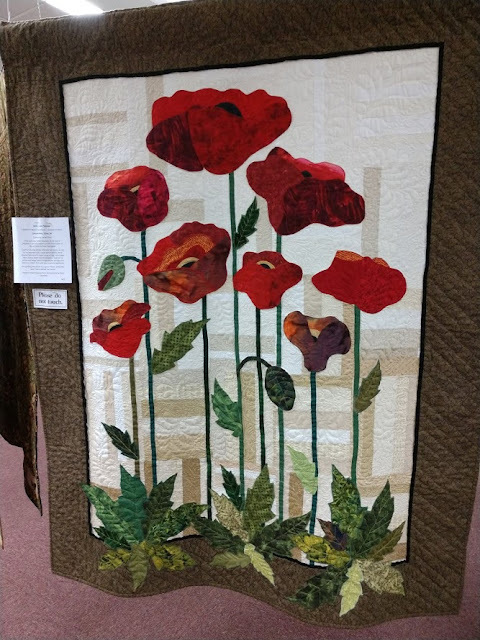 I spent the afternoon at a quilt show, with Ruth. For the last ten days we've had rain. For at least the next five, it will rain. I may go out soon to photograph our state of floating away. 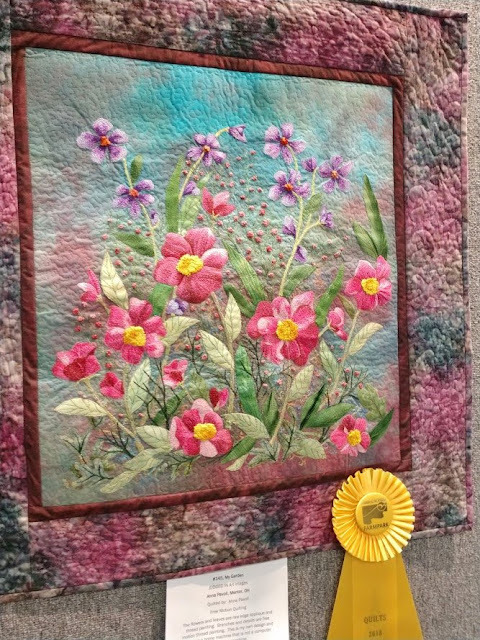 But, I went with Ruth to Lake FarmPark Quilt Show. I turned in my ballot unmarked, at the end. Here are all my favorites. This quilt is called A Happy Day. That's all. No further explanation. I thought of Elephant Child's balloon fests. This quilt is as good as it looks. For a minute it was Tolkien, to me. Then I said "Oh, Joanne. Harry Potter." Poppies, well done, are fine, any day. I would call this one "View from a kitchen window." Had I voted, this would have my Best of Everything vote. And this one I picked for my mother. She would have selected all these fabrics, especially the green. She would have laid it out exactly as this quilter did. 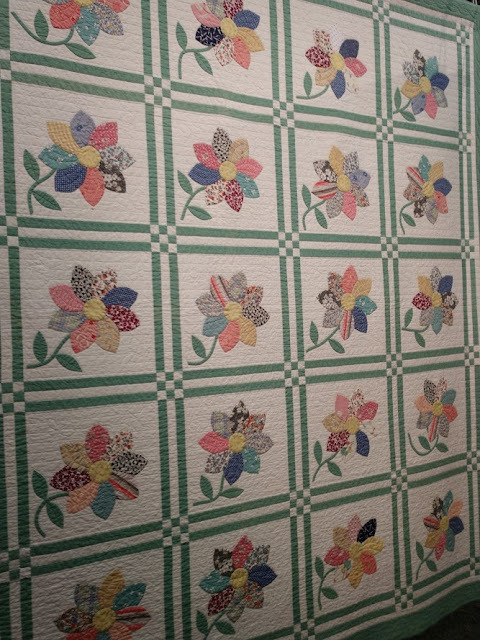 She also would have hand pieced and quilted this quilt. A lot of talented people put those works of art together. Those are all spectacular quilts. They are beautiful and you would know how much work they are, too. I'd choose the same one you mentioned. The quilting is interesting and I love the colours. Be careful in all that rain (and melting snow, I imagine). All of these are just fabulous. Thank you for taking us along. They're all stunning, but my fave is the cherry blossoms and full moon -- I love how the quilter put concentric circles around that gorgeous moon! I love a good quilt show too and have not been to one for awhile. The moon is the most simple element of the design, and the most bewitching. Oh my gosh! This is totally incredible! They are all masterpieces and it was so much fun to see them. Thank you for sharing them with us, Joanne. Such talented people, I am envious. All the quilts are lovely, but the poppy quilt is my fave. I'm with you on the Best of Everything vote. Gorgeous. They are all so beautiful. The first one would make a great wall hanging in a beach house. I like the last one best, that lovely soft green. Every one is beautiful. I think I would choose the poppies if I had to pick only one. So glad you spent a happy afternoon with Ruth. Many rainy days here, too. Gorgeous work! Love all of them! Those are all so beautiful. I'm still working on a quilt that I started in 1989. It's the hand quilting that keeps me from finishing it. Back then, you didn't machine quilt... And I used a cotton batting, so the quilting needs to be no more than an inch and a half between. I hope I actually finish it someday. The quilting is secondary, the judging was on the patchwork. 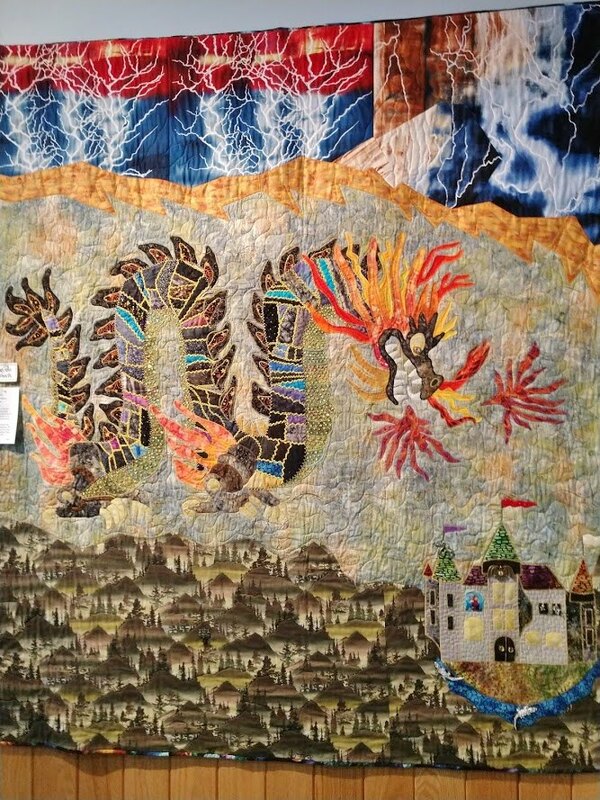 The moon quilt that fascinated me is hundreds, or thousands of small bits of fabric, cut for the color and sewn as if they were the bits of paint in a picture. I've watched this technique grow to an art form over the last fifteen or twenty years. My brain cannot grasp the technique. Wow! Much work went into those. Stunning!! 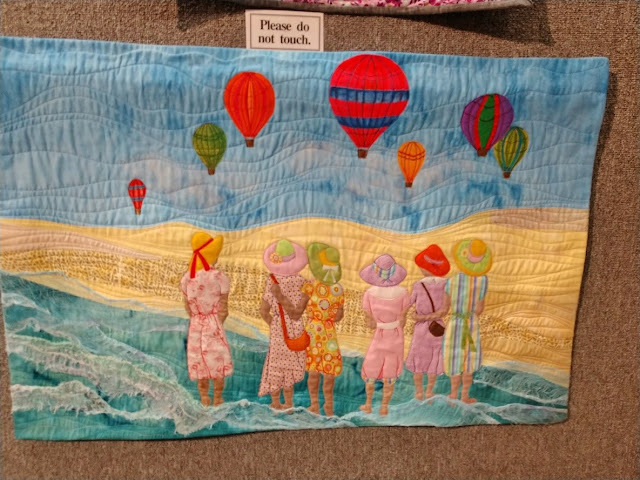 There are few things I enjoy more than a quilt show - thank you for these wonderful pictures. And yes, I agree with your "best of" choice. What a talented lot! Such beautiful quilts! I would have had a very difficult time picking out a 'best'. amazing skills and color choices. every picture changed to 'that's my favorite' but I do believe it is the second to last with the moon. had I stuck with fabric for a medium I might be a quilter. I miss your green tree but feel like your brown one right now!! I love the happy day one Joanne but they are all so very well done and so American too. Though there is ice in the pond, the tree is very red with new growth. Spring is coming. Aren't they fascinating? These are works of Art... not just quilts. I quilt, but very simple 'functional' pieces- not art, but love looking at these! I agree with you on best of everything. They are all beautiful. What a wonderful afternoon. 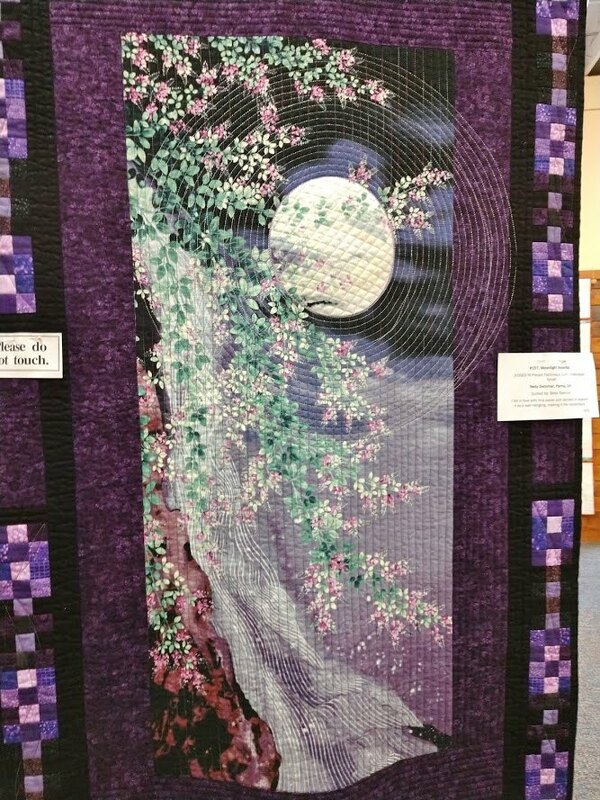 Stunning quilts. I more than like the Poppies. I love the last one; simple, cosy and very pretty. If I had a vote and had to vote, I'd probably pick the poppies.